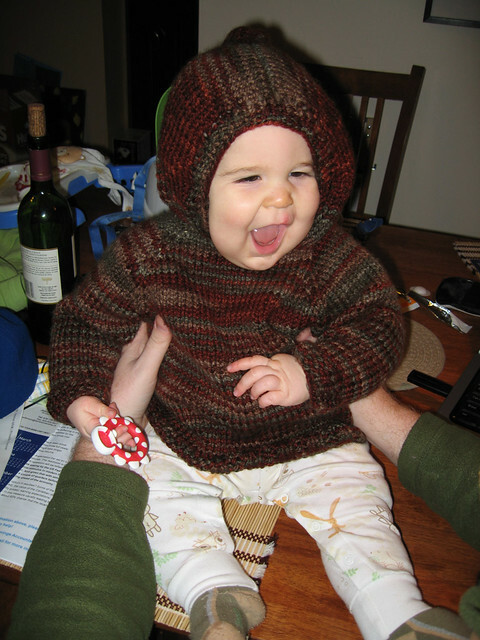 This is a pattern that I actually found on Ravelry a long time ago but because it was hosted on Geocities is no longer available. I was disappointed in that I was looking for the pattern again to make it and it wasn't until my toddler dumped over all my printed patterns that I found the pattern! With larger needles CO 56 sts. Join in the round and knit one round. Round 3: Increase on both sides of each stitch marker. You will have 10 in the sleeve portions and 22 across back and front portions. Switch to smaller needles and work in k2p2 rib for 7 rows. BO in k2p2 pattern. Round 1: k the 34 sts on first holder and PU 2 sts in the underarm. Work 3 needle bind off across. Sew to unworked sts on neckline. Once again, I'd like to enphasize that this is NOT my pattern and that I am simply posting it back on the interbutts for anyone who might be interested in making it. Super cute. Going to cast on right now for my daughter! Thanks for sharing. Thanks for sharing this. Have been looking for one like this and in this size for some time. Is there a pattern for this in a 2/3T? Thank you so much. I have been looking for the right sweater for my sweet boy. I'll be casting on tomorrow.